Hayrides aren't just for Halloween! 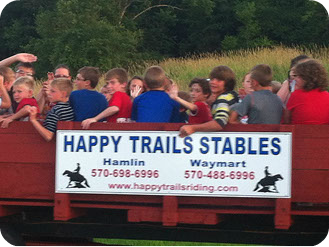 You can take a scenic hayride at Happy Trails Stables anytime of year. 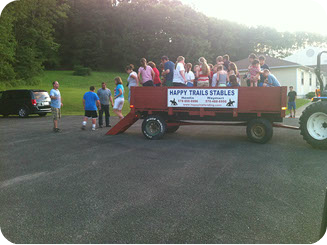 Our hay wagon is tractor pulled, can fit 20-30 people at once and can be decorated for any occasion. From Halloween to birthdays and family gatherings. Your entire party can go out before or after a trail ride, call today for rates and reservations. Now available at our Waymart location!